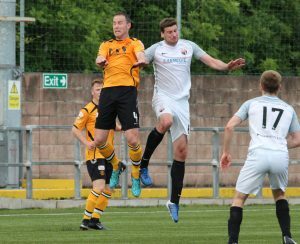 Annan Athletic failed to build upon their last two impressive victories by a determined Montrose side who came to Galabank undefeated in the league and who left with all three points courtesy of a set piece goal scored in the 43rd minute scored by Paul Watson. It was an entertaining match which was dominated by 2 well drilled defences limiteting opportunities at both ends, Montrose will probably feel that they just edged the victory but Annan will no doubt feel disappointed at losing the goal from a set piece. Annan boss Peter Murphy was forced to make one change from the side which defeated Berwick the previous week with Dan Orsi starting in place of the unavailable Ryan Stevenson. Montrose were at full strength following their excellent start to the season. Annan started the match well forcing a corner in the 3rd minute followed by a superbly worked move down the right finishing with a superb shot from Ryan Sinnamon which keeper Alan Fleming tipped past the post. Montrose replied in the 9th minute when Paul Watson’s well struck shot was deflected over the bar by Steven Swinglehurst. Montrose continued to push forward and in the 20th minute they almost opened their account, following an Iain Campbell corner form the right Chris Templetons’s header clipped the top of the cross bar. As the game edged towards half time Montrose keeper Alan Fleming pulled off a brilliant save low down. Minutes later Annan were undone following a set piece corner swung in from the left when Paul Watson ghosted in at the back post unmarked to score with the simplest of headers from two yards. Scoring opportunities in the second half were limited again by the defensive capabilities of both teams. Aiden Smith’s 50th minute run to the bye line ended with a dangerous cross which was scrambled clear and in the 60th minute Smiths header from a Peter Murphy cross was headed past the post. In the 74th minute Annan were fortunate when Chris Templeton’s header from a free kick went narrowly past the upright. The introduction of Blair Henderson for Rabin Omar in the 76th minute gave Annan more threat up front and within minutes of his introduction the striker was thwarted by a point blank Alan Fleming save. Annan tried desperately to square the game. No doubt Annan would have been disappointed to lose the goal they conceded after a fine defensive display, the same could be said of the Montrose side who looked solid at the back marshalled by ex Dundee United stalwart Sean Dillon who limited Annan to very few scoring opportunities. There was not a lot between the teams Montrose possibly just edged it in terms of possession. Stirling Albion maintained their 100 per cent record with a 4-2 victory over bookies favourites for the tile Peterhead. Berwick bounced back after their heavy defeat by Annan to defeat Cowdenbeath by a single goal. Elgin City’s 3-0 victory at Edinburgh City leaves City propping up the league and Clyde and Stenhousemuir had to be content with a share of the points in a 1-1 draw. Annan get a break from the league next Saturday when they face the long haul up to Peterhead in the Irn Bru Cup. Peterhead were fortunate to lift the points at Galabank in the opening game of the season with an injury time winner and no doubt this match will be keenly contested by both teams. Annan Athletic – Jim Atkinson, Scott Hooper, James Creaney, Peter Murphy, Peter Watson, Steven Swinglehurst, Dan Orsi, Ryan Sinnamon (Owen Moxon 70 min), Aiden Smith, Rabin Omar (Blair Henderson 76 min), Brandon Luke. Subs not used Alex Mitchell (GK),Ellis Pearson, Jack Brannan, Ayrton Sonkur. Montrose : Alan Fleming, Cammy Ballantyne, Andrew Steeves, Matty Allan, Sean Dillon, Iain Campbell, Jamie Redman, Liam Callaghan, Paul Watson (Graham Webster 65 min), Connor McLaren ( Craig Johnstone 80 min), Chris Templeton ( Ross Campbell 78 min). Substitutes not usedKerr Hay, Ryan Ferguson, Michael Bolochowecky, Jordan Millar GK. Referee – John MCKendrick. Assistants John McCrossan and Alastair Grieve.